Want to Apply Baby-Led Weaning. Notice This - When our baby is 6 months old, it's time to introduce complementary foods. Maybe you will be interested in using Baby-Led Weaning method when giving food. But before using this method, you need to pay attention first things important to this method. 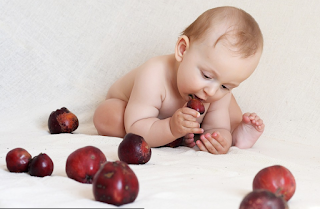 Baby-Led Weaning was first popularized in the UK and now has been done various countries. Baby-Led Weaning is an alternative method of feeding a chaperone without providing soft foods like puree, porridge, or gravy. Baby-Led Weaning is a method that lets your baby eat alone without feeding it with a spoon. Many parents unknowingly have used the Baby-Led Weaning method in their child. this is common in the second or later child when looking at and imitating his brother while eating together. He will try to take food and plates and bribe his own food into his mouth. In general, parents who apply Baby-Led Weaning argue that your child can eat anything without having to feel afraid and difficulty when starting a more solid food. But this can not be proven yet but the little one will be able to receive family meals very easily. Can train baby's chewing skills. Introducing a variety of foods in infants, so as to explore flavor, texture, aroma, and color. Building healthy eating habits with family. But this method has the disadvantage of eating a messy and wasteful. Imagine when the baby is eating while playing by throwing food floor so much food is wasted and make the necessary nutrients will be reduced. The most important thing in applying Baby-led weaning is to always accompany your child. This is to avoid your baby choking on food when consuming whole foods. How to do baby led weaning? In order for Baby-led weaning method to run well, consider the following tips before giving food to your baby. Let your baby sit in a special baby dining chair, so he used to eat in place. Do not forget to keep being watched during the meal, even though he can already feed himself. Some foods may be appropriate if given to introduce the type of food for this method. Suppose the raisins, strawberries, whole grapes, hard fruits and vegetables, corn and whole flesh. Provision of food either by conventional methods (provision of porridge and puree) or BLW, both should be equally concerned with nutritional intake. In the food given should contain high calories and contain iron, zinc, protein, and healthy fats to support the process of growth and endurance. The easiest way to apply BLW is to let the Little eat together at the dinner table with other family members.